Like so many of my peers, I have had a ridiculously busy week. Unfortunately, some duties had to be shirked in order to make way for those who were most important…..sorry EGB…. Today, I had an interview with Limited Brands, Inc. and Monday I will have one with Anheuser-Busch, Inc. Both good companies and both simply ideal. It’s just this pesky business of graduating that is holding me back from all that I can be (in the corporate ladder sense). I am just so very sleepy right now, I haven’t the energy to look at my grades or make the necessary study guides so I can at least feign competence in my work. Speaking of competence, I had to attend a separate Micro lab yesterday (completely throwing off my entire schedule) and the entire lab seemed to be in the throws of incompetence, besides the fact that the lab is a complete and utter waste of my time….time I will mostly likely look back upon with scorn, knowing all the more fantastic things I could have been doing…. 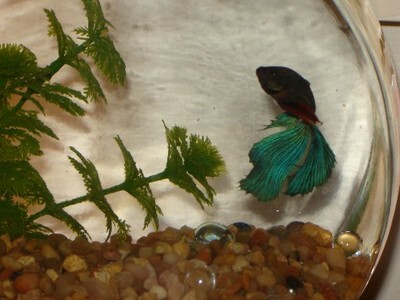 I’ve purchased a new fish: Bartleby Irving Trish Fish III. I cannot believe how much smaller he is than his predecessor. 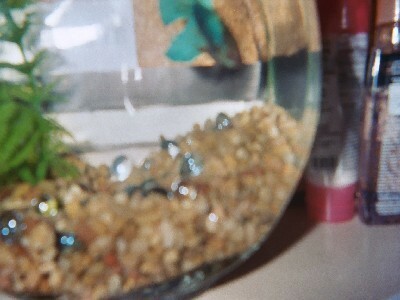 I suppose keeping the same fish for nearly two years, would allow for some growth, but it seemed so unbelievable whilest I stood in Petco searching for my new pet. My new Bartleby seems so small and tiny….he’s like a baby. I’ve been keeping him on my desk for now, since it only recently dawned on me that the former Bartleby did not float away from my hands as quickly because he had been so accustomed to me. Bartleby the second sat on my desk right next to me while I was in the dorms AND all throughout last year. It was only in this new apartment that I had decided to place him on my bookshelf instead. Though I do not plan on keeping Bartleby the third on my desk for another year and half, I do feel it is prudent to keep him close, just so he knows that the brown hand coming toward him will most likely mean food and not something to fear. Yesterday was also Agent Scully’s birthday, and although The X-Files has long since been over, I could not help, but mention it, since it will probably be a date entrenched in my mind until I am very old. I’m not quite sure how to feel about continuously remembering the fake birthday of an imaginary character while never being able to remember exactly what went into the specific media I used in the last Micro lab. Cheers to my pretty fish! Phew! Made it before midnight! There are days, much like today, when I’m so very happy that I fear my own death more than sin, hate or all the evil in the world, because when days go as badly as today, a bottle of pills feels like just the right thing. watched “The Guys” perform on American Idol tonight and, of course, “the Idol” always makes me happy. There were the performers who I knew had no business being there, while there were the ones who gave me chills; nonetheless, the guys were not half as good as the girls. I always know when I have found my favorite “Idol”: I want to download the song he or she sang; not the original version, the version they sang. Alas, it makes me wish I had the talent of some of those kids at sixteen years old….. I feel a little better now having accomplished a few of the priorities before the end of the day, and here’s hoping this slight sliver of contentment carries into the next morning when things really get interesting. Nothing much to say about today, except the same old thing. ….well, while it is still a stone’s throw from perfection, it will have to do for today. Oh, and I miss my Bartleby.